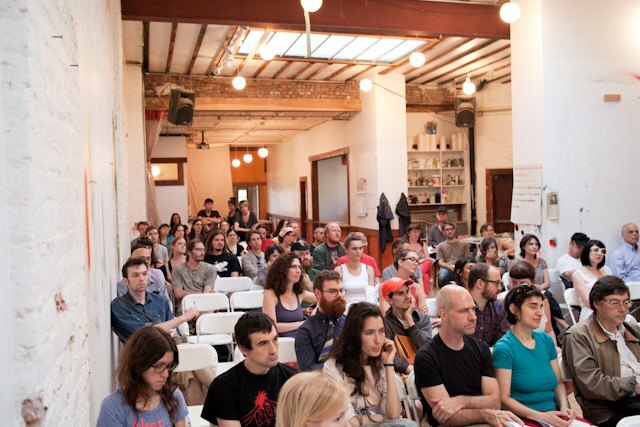 Mobilization of Bushwick Against Gentrification Began. Will We Be Able to Stay? Two important meetings that dealt with a question as old as New York were held last night in Bushwick. The first one, a regularly planned Community Board 4 meeting was set to discuss a proposed rezoning of nine square blocks off the Flushing Ave J train stop, near Woodhull Hospital, in order to create an apartment complex with two added streets, open space, and a retail area. (Read Meredith Hoffman's exhaustive report at DNAinfo). 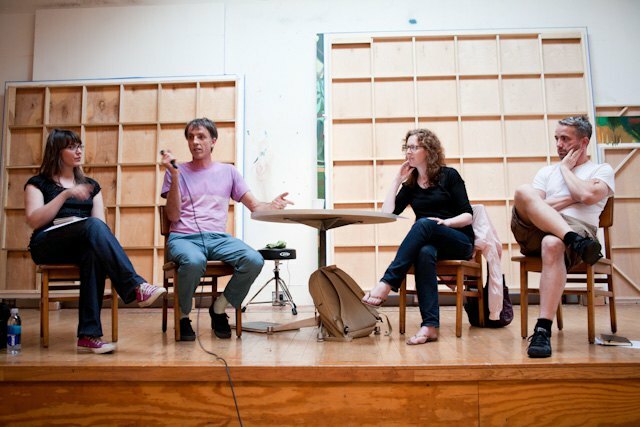 A prominent Bushwick-based artist, Jules de Balincourt called another meeting, which unfortunately overlapped with the Community Board 4 meeting, to discuss how artists can stay in the neighborhood. The task of the day was to find a way that would allow artists to buy property in Bushwick and resolve the vulnerability inevitably carried with a lease. If Read Property Group's proposal gets the go-ahead from the city (after recommendations of Community Board 4 and the borough president are made), we will witness the erection 70 and 80-foot-tall apartment towers containing 977 apartments. 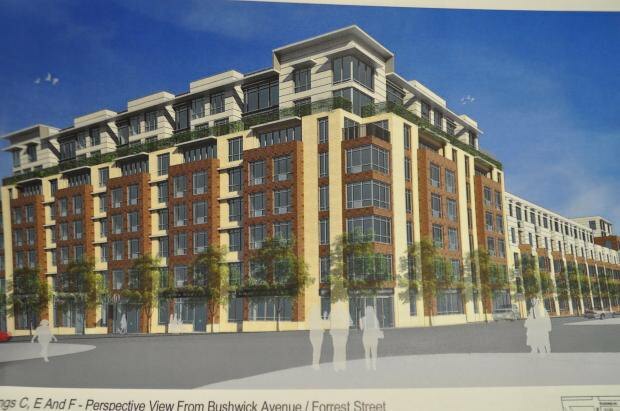 Even though the project includes affordable housing for 24% of the units, the question remains: What will the impact of this project and other similar projects on Bushwick be, and will we be able to stay? Community Board 4 has voted to delay their vote on the project. Let me stress again that Community Board rulings have only advisory function, and it is the city that will decide. Over at Starr Street, Jules de Balincourt mobilized about 100 Bushwick artists to come and talk. Jules himself, despite his relatively young age, has gained great recognition in the art world, and in 2006 he purchased property in Bushwick. Thanks to the positive example Jules is giving, he has proved to have a positive impact on the local artistic community. “If Jules could do it, maybe we can too,” was probably a thought on the minds of many at Starr Space that night. Jules invited artists William Powhida, Lynn Sullivan and art critic Paddy Johnson to help him hold the meeting. 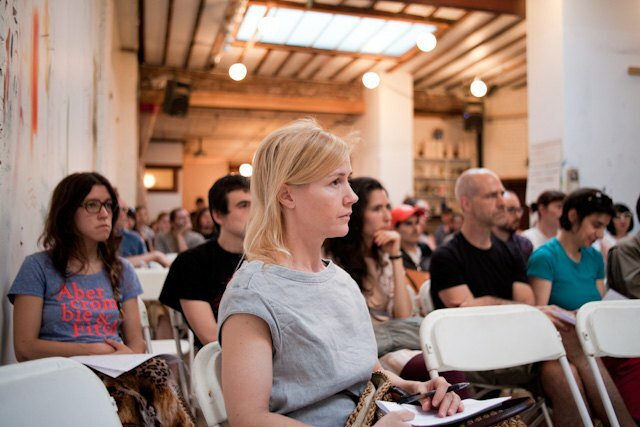 The idea of a meeting was simple – to discuss and brainstorm the ideas and experiences within the community that would eventually lead groups of artists to buy property in Bushwick. People who came to the meeting had a variety of backgrounds (from real estate to city planning to academia), which may be of great use to the group. “We need lawyers, mortgage wizards and others to join the committee and move these things forward,” Jules de Balincourt said. “It’s gonna take a village,” somebody from the audience added. Many people talked about models from abroad that they have seen work. For a year now, William Powhida has been working on a model of a trust, cooperative or “some sort of collective ownership” that would acquire a commercial building. 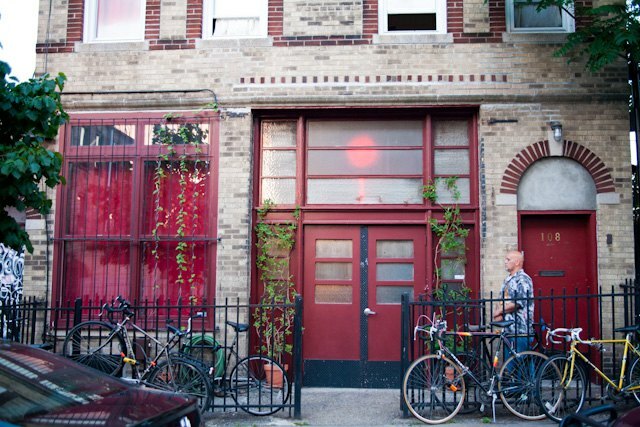 The studios and other commercial space in the building would be affordably rented to artists;, and the rent would be used as mortgage payments. Any accrued value would be used to replicate this model in another building in the future. Somebody at the meeting asked, “Do we want to confront gentrification or just install ourselves in it?” No clear answer was given, but I believe that an initiative like Jules’ may challenge the cycle, provided that artists don't try to solve the problem in isolation. Artists need to connect with specialists, such as real estate lawyers, brokers, specialists on financing and urban planners - not all of them are "bad." At the same time, it is also vital that artists finally connect with long-term Bushwick residents because they are in a very similar position. They are dealing with questions of whether they will be able to stay in a place they call home, whether they will be able to benefit from the community they helped build. While long-term residents attended the Community Board meeting, artists had their own - the only reason for this being that Jules and the organizers didn't know about the simultaneous meeting on Linden Street.